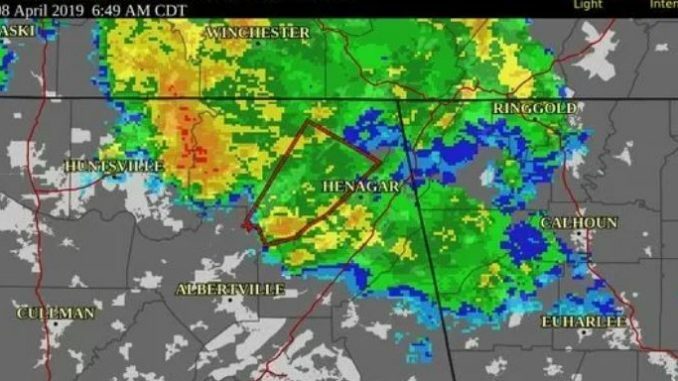 The National Weather Service thinks a tornado may possibly have touched down in parts of Marshall and west-central DeKalb counties in Alabama on Monday morning. Afterwards the storm continued to track northeast with a tornado warning staying in effect for Jackson County until 7:15. At 7:03am the storm was located near Scottsboro and was moving northeast at 40 mph. That was a radar confirmed tornado, however the weather service said earlier that a debris signature was detected with the storm in Marshall County on radar, indicating debris was being lofted into the air. The weather service also got a report of a visual confirmation. Damage has been reported in the Guntersville area. The weather service said emergency managers reported trees and power lines down northwest of Douglas in a path up Highway 431 into Guntersville. There are reports of damage at the Guntersville Walmart as well. This storm also prompted an earlier warning in Blount County, and the weather service has gotten a report of trees down and damage to a mobile home on Highway 79. The National Weather Service in Birmingham said that it will be sending out a survey team today to look at the Blount County damage.